Sepio Systems' board includes former Mossad director, Tamir Pardo, and its advisory board includes former CIA chief information security officer Robert Bigman. Israeli Army Intelligence Corps and is now co-chief executive officer of Sepio Systems in Gaithersburg, Maryland. His firm specializes in hardware security and was hired to scan several large data centers belonging to the telecommunications company. Appleboum says that Super micro "is a victim -- so is everyone else," and that he has seen "similar manipulations of different vendors' computer hardware made by contractors in China," according to Bloomberg. He adds that his concern is that there are numerous points in the supply chain in China where hardware can be manipulated - which are virtually impossible to track down. "That's the problem with the Chinese supply chain," said Appleboum. Based on his inspection of the device, Appleboum determined that the telecom company's server was modified at the factory where it was manufactured. He said that he was told by Western intelligence contacts that the device was made at a Supermicro subcontractor factory in Guangzhou ... The tampered hardware was found in a facility that had large numbers of Supermicro servers, and the telecommunication company's technicians couldn’t answer what kind of data was pulsing through the infected one, said Appleboum, who accompanied them for a visual inspection of the machine. are core to our business and our company values. We take care to secure the integrity of our products throughout the manufacturing process, and supply chain security is an important topic of discussion for our industry. We still have no knowledge of any unauthorized components and have not been informed by any customer that such components have been found. We are dismayed that Bloomberg would give us only limited information, no documentation, and half a day to respond to these new allegations." Shares of Super Micro dropped as much as 27% in Tuesday trading, and are down approximately 45% since October 3, before the initial Bloomberg story hit the next day. 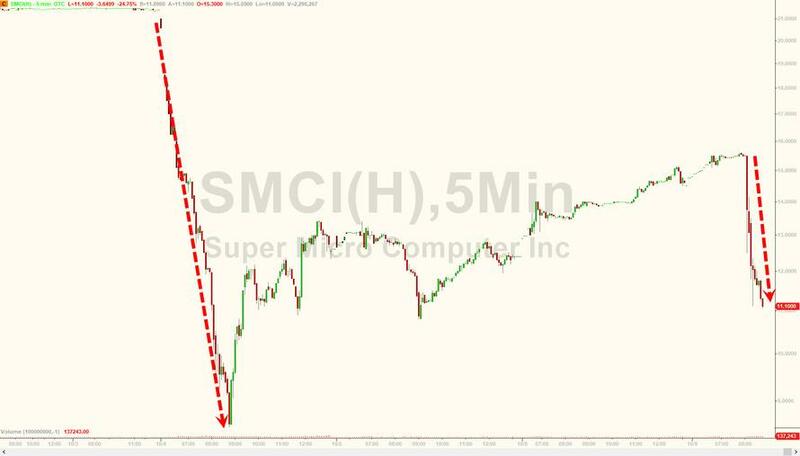 Super Micro strongly refuted the initial Bloomberg report, while both US and UK intelligence officials put out statements over the last several days in support of Amazon, Apple and Super Micro - who say it never happened. As Bloomberg notes - the new manipulation is different from the one described last week, however it shares key characteristics: "They’re both designed to give attackers invisible access to data on a computer network in which the server is installed; and the alterations were found to have been made at the factory as the motherboard was being produced by a Supermicro subcontractor in China." Manipulated hardware is extremely difficult to detect, which as led intelligence agencies around the world to invest billions of dollars in such sabotage. The United States is known to have implemented extensive programs to "seed technology headed to foreign countries with spy implants," according to revelations by former CIA employee Edward Snowden - however China now appears to be sneaking their own versions onto hardware made within their borders. The goal of the spy implants is to establish a "covert staging area" within sensitive networks, which is what Appleboum says was happening in the new case. Once the implant was identified and the server removed, Sepio's tream was unable to perform further analysis on the chip. One problem, according to national security experts, is that in a cybersecurity industry approaching $100 billion in revenue, very little effort has been made to inspect and detect hardware tampering. This has allowed intelligence agencies around the world to manipulate hardware virtually unfettered.